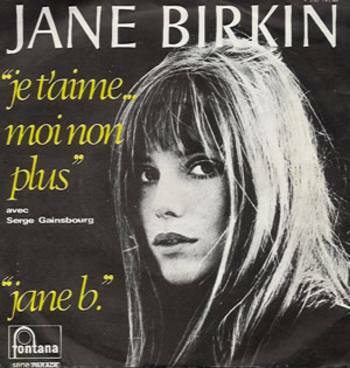 Jane Birkin and Serge Gainsbourg duet “Je t’aime … moi non plus”, translated: I love you… me neither, was the first ever number one hit to be banned by the BBC. It was also banned from radio play in Portugal, Spain, Italy, Poland and denounced by the Vatican in a public statement. Although at the time of its release, in 1969, the sexual revolution was celebrated, most radio stations still were not able to cope with such explicit lyrics, as “Je vais et je viens, entre tes reins” (“I go and I come, in between your loins”), “L’amour physique est sans issue” (“Physical love is pointless”) and “Tu es la vague, moi l’île nue” (“You are the wave, I the naked island”) not to mention Birkins moans and groans. Originally the song was recorded with Brigitte Bardot in 1968, but due to the fact that she got married in 1969 with Gunter Sachs, she pleaded with Gainsbourg not to release it with her voice.